So psyched for Sean Milnes, he's headed out to the Midewest Mayhem competition in Milwaukee next weekend to get rad with some of the best fixed freestylers in the nation. 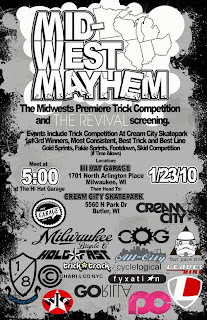 A trick contest at the Cream City Skatepark?...all you Sean! Check out all the hype over on Prolly. I'm working on some custom threads for Sean to keep him cozy warm while rocking out TYRANT style in the MKE. Good luck dude, and be sure to get a fresh High Life while in town!